This weekend Esther and I helped out with the Harper Youth spring retreat at Ft. Flagler. Esther organized the food for the weekend and I tagged along as a chaperone. Fort Flagler is a beautiful location with it's sweeping view of Admirality Inlet. The weather was good and the program went well. Pastor John led the youth through the 'contagious christian' material. 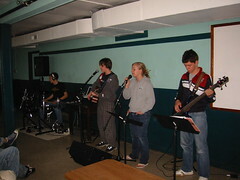 The youth seemed to really enjoy the teaching and the worship.